Once in position, the most common save selection among NHL and amateur goalies are the butterfly (dropping to both knees to make a save). When done correctly, the butterfly involves hip internal rotation, hip adduction, and hip extension. That is an incredible demand on the hips and is performed countless times during practice and an average of 25 times per game (for the shots counted that actually hit the net). The recovery out of the butterfly involves hip external rotation, hip flexion, and hip abduction. It, more importantly, involves spinal rotation. The power a goalie generates, much like a golfer, comes from the rotation of the hips around the spine. 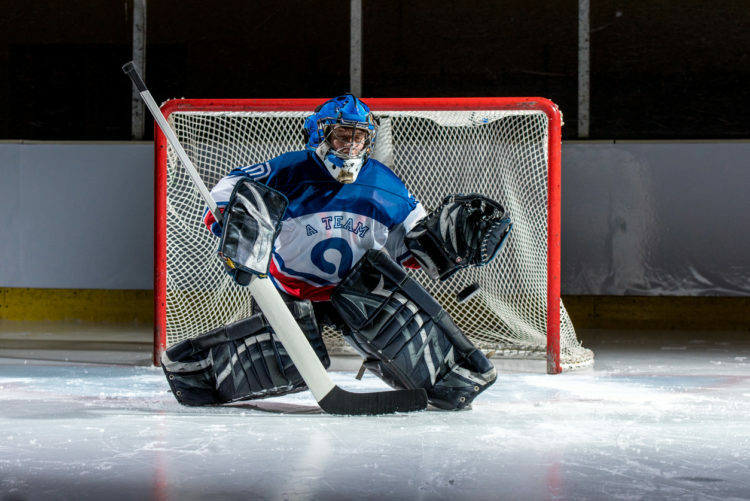 The powerful rotation through the hips allows a goalie to quickly move in a straight line with angle, square, and depth on the next shot when applicable. Watch here. All of the previous motions listed would take a total of fewer than 5 seconds to make during a game. This is a “simple” procedure when following the pass and saving a shot. Within this procedure, posture must be maintained and hands must be able to move fluidly to save the puck as well. Determining what muscles are overactive and underactive is the starting point for any workout routine. If your body is unable to move as a goalie should, there is an increase in risk for injury and an inability to attain peak performance levels. The Overhead Squat Assessment is one of the best tools to find such imbalances. The Overhead Squat Assessment is performed by standing with your feet hip-width apart (shoes off) and performing a squat with control and even tempo while keeping your arms straight and overhead. The squat is assessed from the posterior, lateral, and anterior views. Each view focuses on particular points throughout the kinetic chain to evaluate muscular imbalances. Follow the link for the Overhead Squat Assessment solutions chart. Incorporating corrective exercise is also incredibly important when designing an off ice program. Once you can determine the overactive and underactive muscles using the Overhead Squat Assessment, the first priority is to correct these issues using the four-step NASM Corrective Exercise Continuum. Activate: Strengthening the underactive muscles must be done in a controlled fashion, focusing on the muscle contracting through the full range of motion. Here we are maintaining gains from the off-season workout. Gains should be considered as a ratio of weight lifted to body weight, not the actual pounds, as weight loss may occur during the season. We are also staying injury free and performing at our best. The demand is higher in goalie-specific motions, so you must counteract this by keeping the corrective exercise programming within the workout routine. The primary focus is on performance as workouts may need to take a backseat to games and practice. When weeks have multiple games, the corrective workouts may be the only ones performed. Keep the majority of workouts focused on stability or explosive programming as possible, using various training aids when needed.